They are situated around the junction of the head with the neck. All the superficial structures and some deep structures of the head are darined by them. 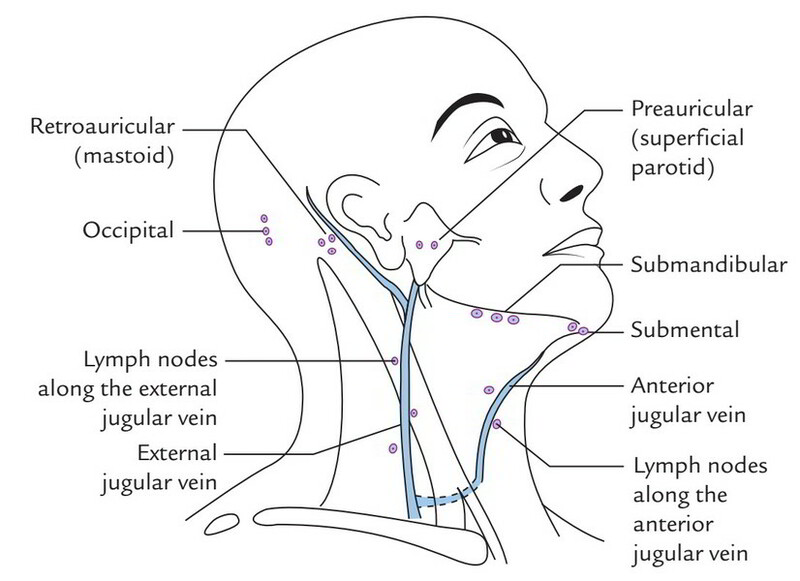 The majority of the efferent lymph vessels from these lymph nodes pass along the internal jugular vein, deep to cervical lymph nodes in orderly manner. Along the external and anterior jugular veins, a couple of dotted superficial nodes are seen. 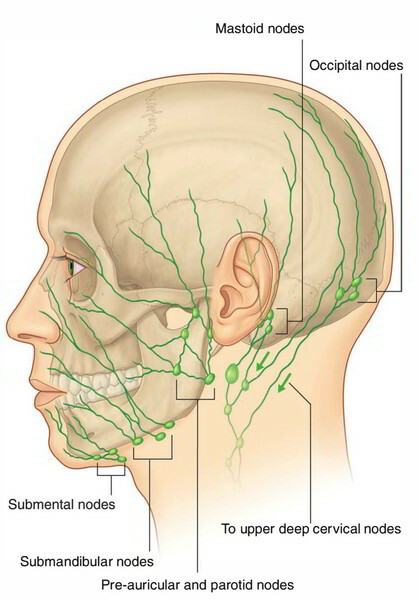 Deep cervical lymph nodes are also drained in by them. Three or four in number, the submental nodes is located on mylohyoid muscle below the symphysis menti (chin) and get the lymph from the tip of the tongue, lower lip and chin. The submandibular nodes, about half a dozen in number, is located on the surface of the submandibular gland and get the lymph from the face, cheek, nose, upper lip, gums and tongue. The preauricular nodes are located superficial to parotid fascia and drain the lymph from the entire scalp, auricle, eyelids and cheeks. One or two in number, the retroauricular nodes are located on the mastoid process and drain the lymph from the entire scalp and auricle. One or two in number, the occipital nodes are located on trapezius about 2.5 cm inferolateral to the inion and drain the lymph from the scalp. They’re noteworthy for being felt in German measles. These groups create a type of ring of lymph nodes at the junction of the head and neck and could suitably be referred to as necklace of lymph nodes at the craniocervical junction. The lymph nodes of pericervical collar are medically felt only when enlarged.